DAREDEVIL #1 Autographed by MARK WAID Marvel Comics with FREE SHIPPING ! (2019) FIVE (5) COPIES DAREDEVIL #1 REGULAR COVER! 1ST PRINT! HOT! the_comiclord has no other items for sale. Details about (2019) DAREDEVIL #1 + 612 REGULAR + SIENKIEWICZ TEASER COVER! 1ST PRINT! (2019) DAREDEVIL #1 + 612 REGULAR + SIENKIEWICZ TEASER COVER! 1ST PRINT! THANOS VOL. 1 #1-12 MARVEL COMIC COMPLETE FULL RUN LOT 1st Print NM. 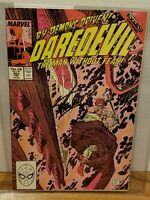 Marvel Comic Daredevil 131 The First Appearance Of Bullseye! Payment MUST be received within 5 days of auction's end. Failure of payment WILL result in negative feedback.